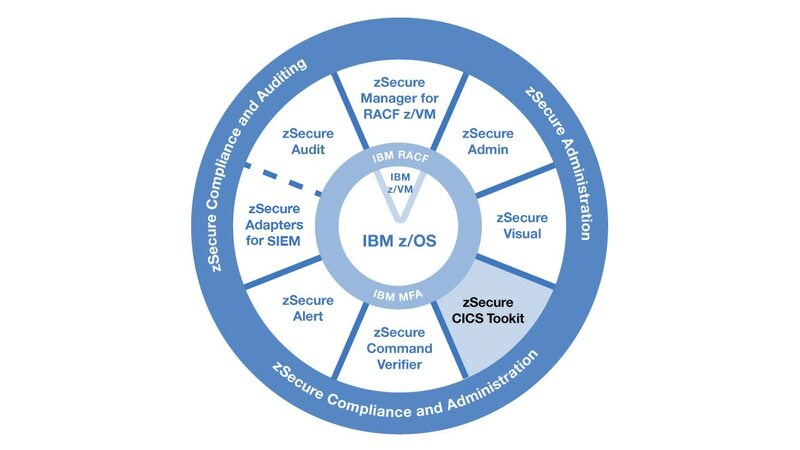 IBM® Security zSecure™ Customer Information Control System (CICS®) Toolkit adds mainframe administration capabilities such as password resets and authorization management to the CICS environment. The software provides the flexibility to distribute security authorization management through CICS transactions for use by local administration. The interface shows only those functions and options that have been delegated to your users, allowing you to extend selected, basic administrative privileges to field administrators while still maintaining control over the types of commands distributed users can execute. Application programmers do not need to know the IBM Resource Access Control Facility (RACF®) database to create a customized RACF security management application, delivering improved time to value. If an application on your Web server communicates with CICS on your mainframe, CICS can use its advanced Application Programming Interface (API) capabilities to execute select RACF security functions. You can easily customize screens using the API to tailor your screens to meet requirements of a specific installation and control the information displayed to decentralized administrators.